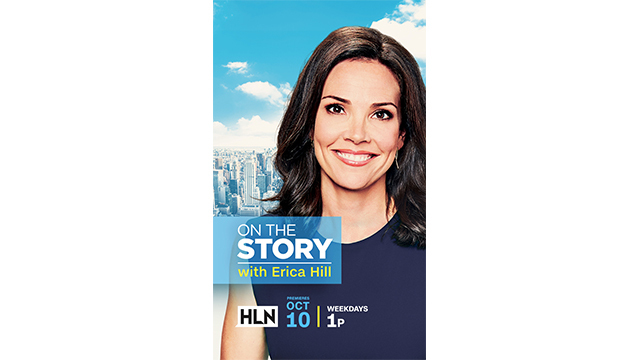 HLN launches its newest daily news program, On the Story with Erica Hill, anchored by the award-winning, veteran journalist, on Monday, October 10. Hill’s program will air in the 1pm-3pm, ET slot, live from the CNN New York bureau. The focus of the new dayside program will be the big events and most-talked about stories of the day. Hill will go beyond delivering the headlines to delve into why the stories matter and how they impact our daily lives. The program will also feature newsmaker interviews. Just prior to joining CNN in July, Hill was co-anchor of NBC’s weekend edition of TODAY, and also served as an anchor and correspondent for NBC News, contributing to TODAY, NBC Nightly News and MSNBC. Before joining NBC, she was an anchor at CBS News. Hill first joined CNN and HLN in 2003, as an anchor and technology correspondent. In 2005, she was named co-anchor of Prime News, as part of the network’s launch of Headline Prime. During that time, she also anchored nightly news updates for CNN’s prime time shows, including Anderson Cooper 360° (AC360°). In early 2008, she moved to AC360 full time. She was part of the NBC News team that won a 2013 Peabody Award for the network’s cross-platform effort, “In Plain Sight: Poverty in America”; in 2015, the Alliance for Women in Media honored her with the Gracie Award for Outstanding Correspondent. Jennifer Williams is the executive producer of On the Story with Erica Hill. Stephanie Todd is Vice President of Programming and Production, HLN. HLN features live coverage of national, regional, lifestyle, and entertainment news in a fast-paced approachable tone with expert-led, personality driven programs. HLN is a CNN Worldwide network reaching more than 100 million households in the U.S. CNN Worldwide, a division of Turner Broadcasting System, Inc., a Time Warner Company, is the most trusted source for news and information.